What Makes HAPPY HORSE So Good ? 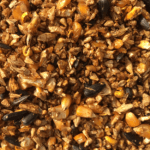 Maize, Barley, Black Oil Sunflower Seed and a very light coating of molasses. Every mouthful of HAPPY HORSE is packed with a healthy assortment of energy, protein, fibre, amino acids and fats that is certain to satisfy the taste buds of any type of horse. HAPPY HORSE is designed to give your horse a bit of a glow, some get-up and go, and a little condition on the side. Categories: FEED GRAINS, Mixed, Pre-mix Feed. 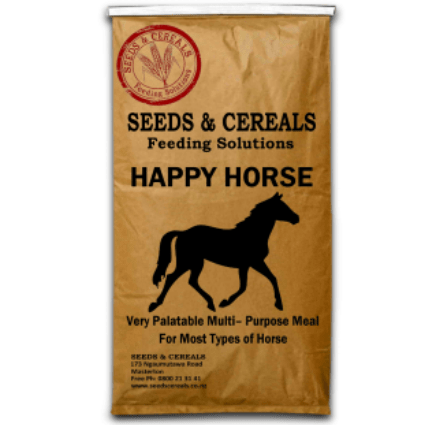 Every mouthful of HAPPY HORSE is packed with a healthy assortment of energy, protein, fibre, amino acids and fats that is certain to satisfy the taste buds of any type of horse. HAPPY HORSE is designed to give your horse a bit of a glow, some get-up and go, and a little condition on the side. This highly palatable meal makes an ideal multi-purpose feed that can be fed alone or have an additional source of fibre and energy added or other things like minerals and medication. Regardless of what premix feed you are feeding your horse make sure it has access to pasture or other form of good roughage and plenty of fresh clean water.